Not doing much playing, just painting and day dreaming. I finished up another 3 1ksons, so now I'm going to move on to the two aspiring sorcerers for my two squads. 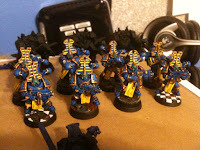 I figure if I can knock them out and move on to that second squad I'd be ready to play (with some BT vehicle proxies). That should only take, eh, the rest of the year. Aside from that I've done some poking around on ebay but am trying to stave off the 'I can just buy this crappily painted item and redo it' since the whole point of this army was supposed to be about making it look as good as I can. I'm just feeling like I want to play it and get a feel for the army. Of course for better or worse there just hasn't been the time, and with the holiday's coming it remains to be seen how much gaming we really get in until after Christmas.